Numantia, a historical, turn-based combat title brought to us by Recotechnology, serves up a lesson on the Ancient Roman colonization of Hispania. 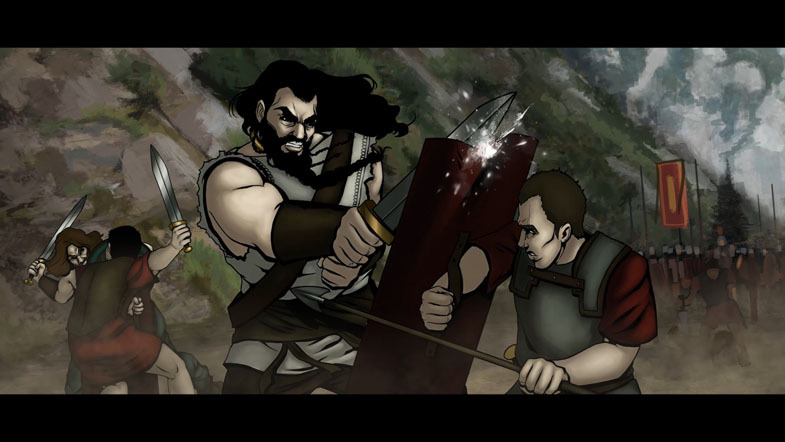 After you choose either the Roman commander or the leader of the Numantian tribe, story crops up in the form of short cutscenes and then gives you choices to determine the outcome of your campaign. Some choices give the chance to gain morale or resources, others affect the number of troops available to you or the enemy. Gameplay happens primarily as hex-based tactical combat. Mechanics are nothing to write home about, but they do emphasize strategy and clever tactics. The AI isn’t the smartest, as it attacks your weakest, closest-ranged unit every single time. Still, the AI gives a good enough fight that you’ll want to keep your guard up and bait your enemy into a trap. Troop turns are divided by initiative, with faster troops acting more than once in a round, if their initiative is high enough. As your troops are upgraded, they gain new abilities, such as a charging attack for the cavalry units. Basic troop types are all represented: melee warriors, ranged units, such as archers and spear-bearers, cavalry, elephants, and “heroes.” Heroes (special story units) are single units who have special abilities and morale bonuses, encouraging troops nearby to fight harder and stronger. Note — when a hero dies, you lose the game and the enemy wins. Morale shows up as part of gameplay, but from what I can tell, low morale doesn’t change much about how a unit performs. I believe defense and attack decrease in combat, but no units ever broke away or tried to retreat during my playthrough. Aside from special units, like elephants, most tactics on how to destroy your enemy are straightforward: move in and kill them before they kill you. Fighting against elephants did pose a challenge at first, but even so, a skilled tactician will beat the AI with relative ease after figuring out the mechanics. Between battles, you will buy new units, upgrade troops, and buy equipment within the village interface, which also serves as the main method of telling the story. It’s an immersive element, but a bit long-winded when you have to click through scripted scenes all around your village in order to get to the next battle. Most of Numantia feels like it’s been done before — and been done better. I see the appeal of the story, which got me reading about the Numantia tribe and their resilience against the Roman Empire. It was definitely interesting and informative, so props on that, but I feel like I could just play Rome: Total War instead and get a similar dose of history, with a much more polished gameplay. There are clear signs that this is a ported game in the UI and the controls, which leave a mouse and keyboard user having to perform tedious extra clicks while directing troops, or in the village interface. Graphics aren’t anything spectacular; individual soldiers are represented in the unit graphic and diminish when taking hits, and the environment is fine for what is needed. I did notice some glitchy moments and delays. But, something’s missing. 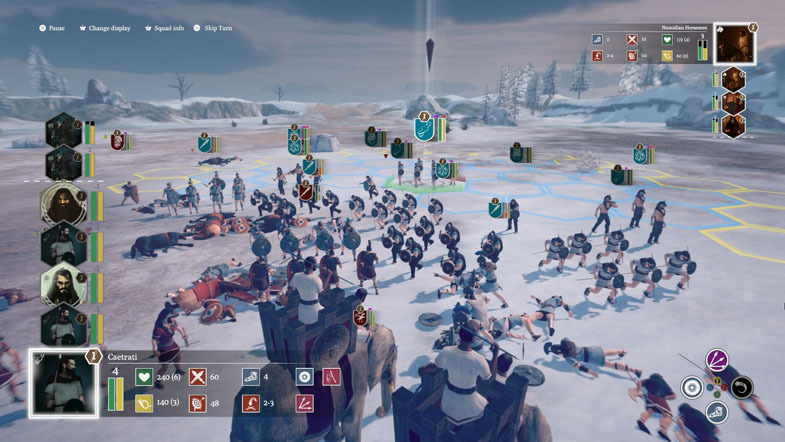 Numantia has a neat campaign and dynamic village troop-gathering and threat response mechanics, but I didn’t feel like my actions had drastic consequences, so it felt more like I was being herded through a plot line than a commander leading an army to victory. This title could help bring folks who have never played a turn-based game into the genre, but if you’re looking for divergent gameplay and politic decision-making, Numantia is lacking. Numantia was slightly disappointing for me, since the characters weren’t all that interesting, and plot armor detracted from immersiveness. I’d recommend this game to a history buff, but then again, gameplay is tired and soporific. An indiscreet console port with clunky controls and bloated, low-quality graphics, Numantia could please genre noobs, but there are better turn-based combat titles for seasoned players to relish.